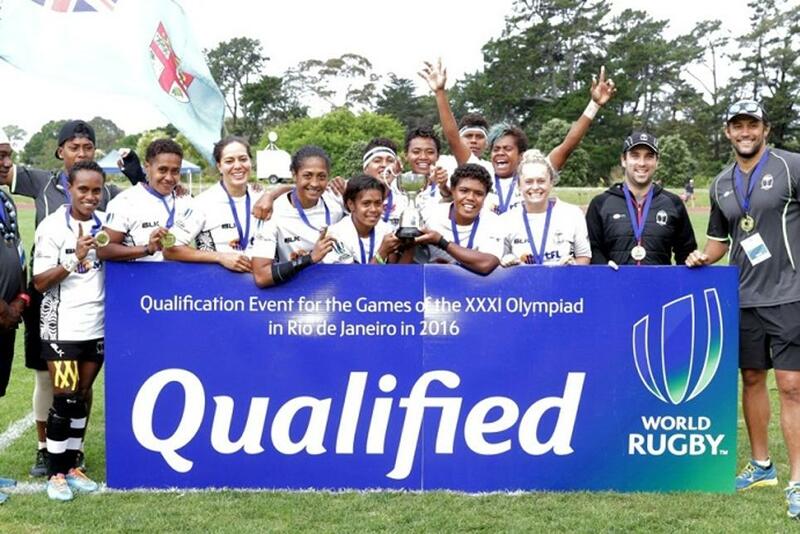 Australia men and Fiji women both won their respective Oceania Sevens titles and were rewarded with places at the 2016 Olympic Games rugby sevens tournament in Rio de Janeiro. Both teams remained unbeaten over the weekend and were clearly the best teams in their respective events as the scores in the finals suggest. Australia beat Tonga 50-0 in their final while Fijiana overcame Samoa 55-0. Under interim coach Tim Walsh Australia were superb over the two-day tournament. Aggressive at the breakdown and clinical at the restarts and with ball in open play they scored 138 points in their three matches on finals day and conceded no tries or points. Stand-out players were skipper Ed Jenkins, Greg Jeloudev and Tom Cusack along with Jesse Parahi who was playing his last sevens event before taking up a Super Rugby contract. Attracting much attention also was 18-year-old newcomer Henry Hutchison whose pace and footwork marks him as a star of the future. “After the disappointment of not qualifying through the World Series in London we have put in five months of preparation. We knew we had the chance to qualify but we lost our coach recently and credit to Tim Walsh the women’s coach who stepped in and has got us to this point and winning the event,” declared Australian captain Ed Jenkins. The surprise of the day was Tonga men who easily beat Samoa in the semi-finals 41-5. It was an impressive performance from Tonga and just reward for a team whose form continued to build and improve as the tournament went on. Second place sees them qualify for the final World Rugby Olympic repechage tournament in 2016. For Samoa, who had looked like a real threat to Australia after day one, it was their worst performance of the weekend. Some consolation is the fact that by beating Papua New Guinea in the third place play-off they will join Tonga in the 2016 repechage. Either Tonga or Samoa could easily still end up in Rio de Janeiro. The Fijian women were the shining stars of their tournament and had pace, physicality and patterns of play that were too sophisticated for their opponents. Fijiana beat Papua New Guinea 43-0 in their last pool match on day two before beating the same opposition 58-0 in the semi-final. Starring for Fijiana were Rebecca Tavo, Litia Naiqato and the dominating presence around the field of Rusila Nagasau who scored four tries in the final. Samoa showed great promise and have improved markedly and by finishing second won a spot in the women’s World Rugby Olympic repechage tournament in 2016. Joining them courtesy of beating Papua New Guinea in the third place play-off will be a delighted Cook Islands who were the surprise package of the women’s tournament.